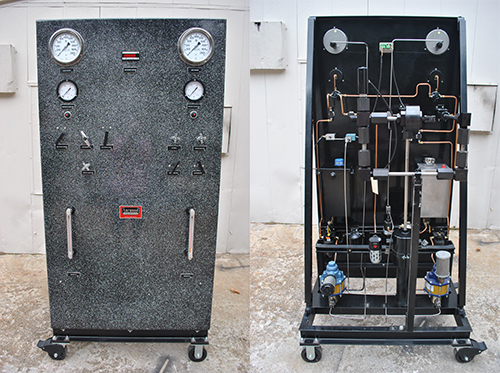 Since 1947 Harwood Engineering Company, Inc has been engaged in the development and manufacturing of high pressure equipment, components and systems to generate, contain, measure and control very high pressure levels in liquids and gases. We produce a full line of high pressure equipment and supplies including tubing, fittings, valves, vessels, intensifiers, measurement cells, and other apparatus to pressures of 200,000 psi, with pumps, compressors and intensifiers ranging from hand-operated models up to 150 H.P. electrohydraulic units. For over seventy years, we have designed and manufactured high pressure equipment capable of producing pure isostatic pressures to 30 kbar, (430,000 psi) at room and elevated temperatures. We also make presses up to 5,000 tons for quasi-hydrostatic pressures, necessary in the manufacturing of diamonds and fundamental studies in pure physics, geophysics, and geochemistry. Over the years, Harwood has developed the “Controlled Clearance” principle upon which primary standards of pressure above the manometer level, to as high as 30 kbar, are used throughout the world. Our controlled clearance-free piston gauge deadweight testers are the basic primary standard for accurate pressure measurement for both liquids and gases. We offer instrument pressure calibrations to 200,000 psi against both primary and secondary standards, as well as pressure testing services such as proof testing, leak testing, isostatic compaction, and autofrettage. The majority of our effort involves manufacturing to each of our customer’s unique specifications, requiring direct and ongoing contact with our clients throughout the entire process. Most of our clients are industrial organizations, educational institutions, research facilities, and government agencies.